BMW added a new model in its new generation sedans named, BMW 518d Sedan 2015. Carrying beneath its hood an efficient engine, model brings for its buyers some exciting new features and looks that will undoubtedly gain eyeballs when you roll this luxurious sedan down the lane. Though attractive enough to gain our attention and few more present but what is to be seen is if it competes well with executive class models from Mercedes and other prevailing automakers in category. 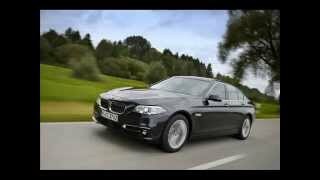 Let us have a closer look at the all new BMW 518d Sedan 2015. Interior of BMW 518d Sedan 2015 is pure sign of luxury in this budget. First to grab attention is the dual-tone dashboard mounted with series of functions, especially on the driver side. While the upper part of dash gets black tone lower part matches the rest of interior and in between these two is a thin strip of glossy-brown color. Light colored leather wrapped seats are comfortable and offer great space beneath to comfortable place your legs while some extra space has also been added in storage compartments and center console which gets cup holders. Another major revision in the interior of BMW 518d Sedan 2015 is amalgamation of iDrive operating system as standard with all models. To give this feature a delighting visual touch, its control display gets the chrome trim finish. In all we found the interior, luxurious, spacious and better through its newly added features. 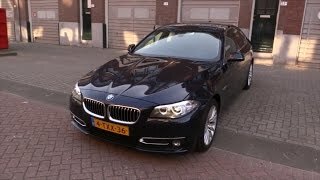 In the exterior of BMW 518d Sedan 2015 not much upgrades were noticed, looking at BMW 518d Sedan you’ll feel like having glimpse of any other BMW model. However a closer look will bring some changes in front of you. Changes which we noticed began with the kidney grille that received additional contour lines while the air intakes too got adored with new structure. As standard BMW offers Xenon headlights with its models while customers get an option to chose LED headlights. 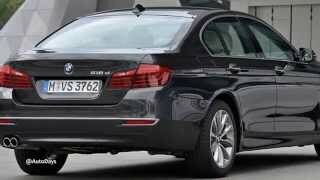 Moving towards the rear of BMW 518d Sedan 2015 changes could be noticed in apron, as it receives some extra crease and yes the taillights that look more attractive with their new design. In all these minute changes bring an attractive and luxurious touch to this new release. BMW 518d Sedan 2015 gets its power through a 2.0 Liter BMW twinpower Turbo engine which delivers total output of 150 hp and peak torque of 360 nm. Though not enough but being frank power is never enough for sped lovers. However looking at its luxurious looks and the category it rolls in, we believe this is a good deal with its reduced fuel consumption, which now stands at 4.6 Liter per 100km.